After the typically long plane flight to Manila, I’m happy to announce that in my first 24 hours, I’ve already had a few delicious Filipino meals and visited the local mega-mall twice. That doesn’t sound like much of a trip report, but the first order of business in any missions trip is simply to get one’s bearings. And it’s obvious that I’m not in Kansas anymore. 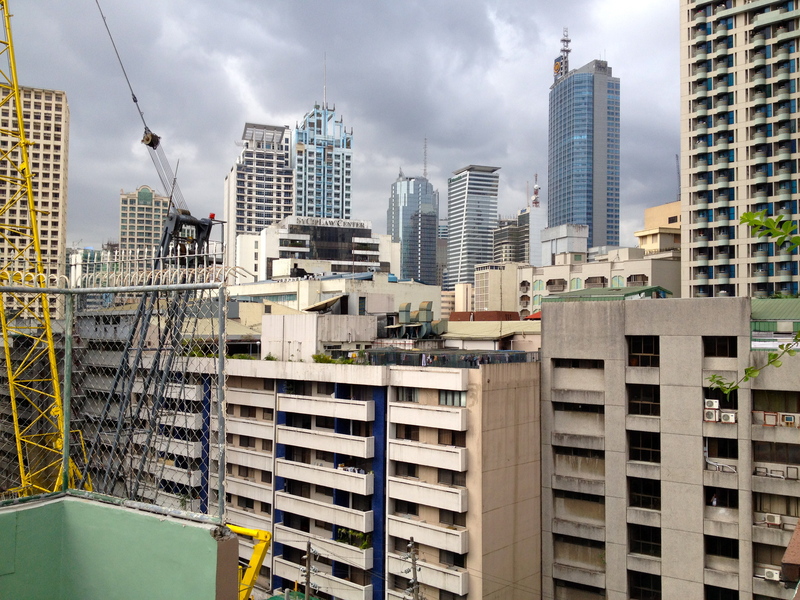 My hotel is deep in the heart of Manila, surrounded by high rises and towering construction cranes. The beautiful high-end mall stands in contrast to some of the more economically-disadvantaged people I’ve already met. The local newspaper announces the killing of top Al Quaida-linked terrorists by Philippine military forces, as well as the impeachment of a Filipino Chief Justice. The hotel cable shares Filipino music videos, local talk shows, Letterman, and Japanese Anime. Speaking with locals, as well as being briefed by field director Gregg Evans, I am reminded that the Philippines is a contrast of third world socio-economic issues and first world sensibilities and sophistication. First thing tomorrow, Gregg and I will be catching a plane for Legaspi City, where the Bicol Center for Christian Leadership (BCCL) is located. I’ll be making that home base as I visit a few churches on Sunday and begin teaching Monday for the following two weeks. I also have an all-day workshop scheduled the following Saturday, and I’ll probably be speaking at a few churches the following Sunday morning and evening. I’ve been encouraged to be flexible as I may be asked to speak or lead worship at other churches and venues as well. My internet access is sporadic and unsure (I was unable to get my iPhone set up here), but I’ll try my best to stay up on the blogging. Until then, thank you so much for your support! Praying for your time in the Philippines, Man! I pray supernatural strength, creativity, revelation and authority – a Kingdom Catalyst of Transformation!! Blessings on you friend! Thanks Matt! Blessings and prayers to you too! We will be praying for you and your family as you are away. Thanks for following God’s lead!